Did Jesse get cheated out of 40 grand? Did Walter cheat Jesse out of 40 grand? Emily, I’m not sure what to make of Jesse’s long, last look at the departing Walter White. Jesse’s obviously rattled, but it’s hard to say why. Walt’s bickering with Mike over the deductions from their take drove conflict-hating Jesse up the wall. He was so upset by Walt’s arrogant nickel-and-diming, in fact, that he offered to pay for the “legacy costs” himself. Jesse doesn’t care much about money, but it’s still remarkable that he’d rather pay Walt’s $117,000 share than listen to an argument. I’m sure he was also annoyed by Walt’s shortsightedness. They own the means of production now, and Walt is still acting like the annoying employee any boss would want to get rid of. 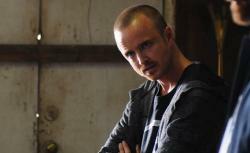 Mike was absolutely right: “Just because you shot Jesse James doesn’t make you Jesse James.” Walt keeps comparing his brand-new operation to the network Gustavo Fring painstakingly built up over 20 years. It’s much easier to depose the old king than to rule wisely, and Walt has no idea how to behave when he’s sitting on the throne. I wonder if there’s another element at play: One of the first deductions from the take was to repay the $120,000 that Jesse fronted for the first cook. Mike took the money out of all three piles: 40/40/40. But why should Jesse repay himself? Surely the division should’ve gone 60/60/0. Walt was swift to jump on Mike when he thought the take was short—he didn’t know about the mules. When the error favors him his mental arithmetic is fabulous, but he won’t speak up to save his buddy $40,000? As the rest of us learned long ago, Jesse isn’t as dumb as everyone assumes he must be. For all his nonchalance about money, he knows disrespect when he sees it. Is that what’s bothering him, I wonder? I love the way that Jesse is coming into his own even more this season. As you say, Matt, he’s been responsible for the biggest, most creative ideas: the magnet and the tent. When he figured out how to fit the agitator motor into the roadie case, I hoped that his old chemistry teacher was proud. Jesse is thinking for himself. It’s just too bad Jesse also lets Walter plant ideas in his imagination, especially because breaking up with Andrea is a terrible idea for the four amigos. Sure, there’d be risk if Jesse told her about the business. But it’s a small risk. Andrea knows how lucrative the drug business is. After what happened to her brother, she also knows how dangerous it is, and how important it is to keep a low profile. On the other hand, Jesse’s more likely to sample his own product if he’s going home to an empty house. Emily, did you, like me, let out a shriek of excitement when Jesse Plemons—Landry Clarke from Friday Night Lights—showed up as part of the Vamonos Pest team? Your TV Club worlds collided! (I think the chances of anyone from Downton Abbey slinging meth in the ABQ are low, so I won’t get that thrill.) I’m glad he spotted the nanny-cam. I guess a good burglar would be sensitive to such things. That initiative—and his famous-to-us face—surely signaled that pocketing a pile of cash isn’t going to be his only involvement with Walt and Jesse. Was anyone else freaked out when Marie pointed out that Walt’s 51st birthday is approaching? All the action of the past four seasons happened in one year! That shouldn’t be a surprise, but I was exhausted by the thought of it. We also know that we’re one year away from the Denny’s breakfast that opened the season premiere. Time flies when you’re cheating death, murdering drug lords and chemistry nerds, poisoning kids, and making and losing a fortune.